Infant sleep sacks are like a cross between a dress and a blanket. They start out like a sleeveless shirt on the top and flow out like a dress at the bottom but are completely enclosed. They zip up the front, creating a cozy sleeping bag for baby. Infant sleep sacks improve sleep safety for newborns by reducing the risk of sudden infant death syndrome, but parents must use them properly to avoid other risks, such as overheating or choking on the zipper. 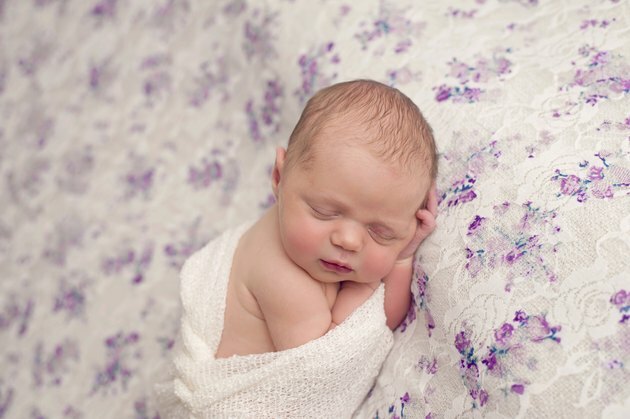 Swaddling helps many newborns to feel snug and secure, helping them to sleep better. As babies grow, they may become resistant to being swaddled. Some parents say that a sleep sack helps their baby to feel secure while also giving him a little more room to move his arms and legs. Sleep sacks can help these babies sleep better at night and ease the transition away from swaddling. Sleep sacks also help keep babies warm throughout the night, unlike a blanket, which may be kicked off or become wrapped around a baby's legs or midsection. Babies need to stay warm while they are sleeping, but blankets and other loose bedding can increase the risk of suffocation and SIDS. Sleep sacks keep babies warm without the risk that the fabric could cover their faces or bunch up around their airways, making it harder for them to breathe. Breathing difficulties are one of the causes of SIDS, and sleep sacks may help to reduce the risk. Overheating is another risk factor for SIDS. Blankets and sleep sacks can both lead to overheating if they are not used properly. Many sleep sacks are made of fleece or polyester to keep babies warm. Parents should dress their babies lightly under the sleep sack, depending on the temperature in the room. When it's very warm inside, parents may need to dress their babies in light pajamas and choose a lightweight sleep sack. Some components of sleep sacks have been reported to cause injuries or to pose a choking hazard. Some parents reported that the zipper on the HALO Sleep Sack caught in their babies' teeth, leading to injury. Others reported that the zipper broke apart into several pieces, which could have been a choking hazard had the zipper been in the baby's mouth when it happened. The Consumer Product Safety Commission recalled some models of the HALO Sleep Sack with pink satin flower embellishments, since they posed a choking hazard. When selecting a sleep sack, look for designs that are free of embellishments and that have Velcro coverings over the zipper or another type of enclosure.